Round sinks give your kitchen an extra dash of style, but they’re usually larger than standard rectangular sinks, so it’s important to make sure you have room for it. 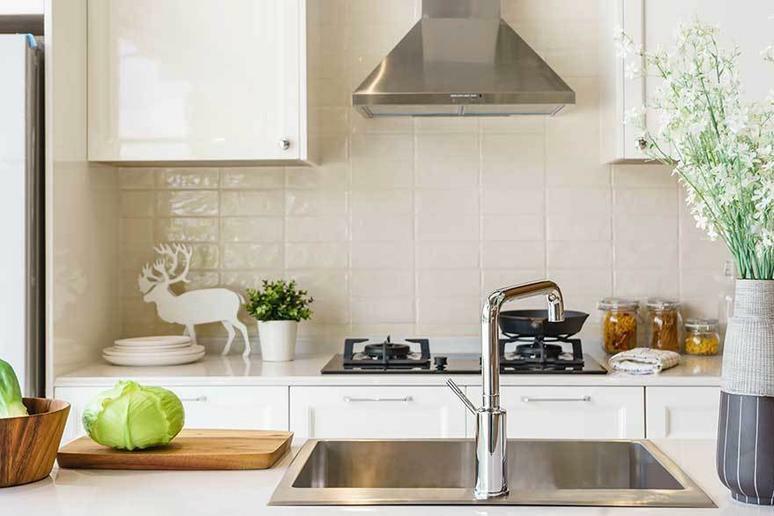 Most people don't give much thought to their kitchen sink, but when it comes time to buy a new one, they realize how essential it is to choose a good one. Low-quality sinks can scratch, leak, or corrode over time. On the other hand, a well-made sink will last for as long as you own your home -- and longer. In order to choose a good one, you have to understand which factors impact the quality and utility of the sink in the first place. Here's a look at the most important considerations. The most important decision when choosing a sink is its size. If you choose one that's too small or too shallow, it might not be able to hold all the dishes that you need it to. Before you purchase any sink, measure the cabinet to determine which size sink it can comfortably hold. Width: Most standard sinks are about 30 inches wide. This is a good starting point for most people, but you might want something larger or smaller depending on your space. If you don't have a lot of room, you may want to look for a narrower 15- to 25-inch sink. Depth: Most standard sinks are about 9 or 10 inches deep. If you don't want to (or can't) go wider, you could go deeper, but not all cabinets can accommodate extra-deep sinks. Shape: Rectangular sinks are the most common and use the space most efficiently, but some people prefer the look of round sinks. Bowls: Single- and double-bowl sinks are the most common, but there are some triple-bowl sinks available as well. Material: Stainless steel is a timeless choice, and most of these sinks are pretty good at resisting stains and scratches. Sinks can also be made of granite, porcelain, soapstone, quartz, and other materials. Each type has a different look, and some are more durable than others. Mounting type: Undermount sinks are especially popular these days, but there are also traditional top-mount and cabinet-mount options, such as farmhouse sinks. Ease of cleaning: It's easier to clean every part of a sink with rounded corners than a sink with very square corners. You also have to think about how well the sink drains and how easily it will show stains. This could determine how often you'll need to clean the sink. Kitchen sink prices: A single-bowl stainless-steel sink can cost as little as $50, while large copper sinks can cost over $1,000. Most kitchen sinks cost between $100 and $300, but the price depends on the size and material. Q. What's the benefit of a double-bowl sink? A. Some people prefer this type of sink because you can use one side for washing dishes and the other side for rinsing or draining. However, if you're looking for a large basin that can hold a bunch of dishes at once, a single-bowl sink might be a better option for you. Q. How do I protect my sink from scratches and stains? A. Wash dishes promptly and clean the sink regularly to remove any debris or chemicals that could cause the sink to corrode. You could also put a stainless-steel grid in the bottom of the sink to keep dishes from scratching it. Our take: This sleek, durable sink will look as good in 20 years as it does today. What we like: This granite sink resists scratches and stains and comes with a lifetime warranty. It's stylish and extra deep, so it can hold just as much -- if not more than -- a standard double sink. What we dislike: Because the sink is deeper than a standard sink, it might not fit well in all types of cabinets. Our take: This is a good choice if you're looking for an affordable stainless-steel sink that will never go out of style. What we like: This sink won't scratch, corrode, or discolor over time. It's simple to install and employs sound-deadening padding on the underside to mute the echo inside of the sink. What we dislike: Some reports of food residue left behind when sink is drained. Our take: This is a good choice if you're looking for a large double sink from a maker known for quality, but it might not fit in all kitchens. What we like: This double-bowl sink has a corrosion-resistant finish and sound insulation to keep it from echoing too much. The two bowls are large and deep, so they can hold quite a lot of dishes at once. What we dislike: This sink is a little pricey, and it might not fit in all types of cabinets because it's deeper than traditional sinks.